Last year, I was an ambassador for the inaugural Bag It Forward campaign sponsored by Elmer's. The project asked bloggers to "bag it forward" while shopping for their kids' school supplies, filling up an extra bag for needy kids or underserved classrooms. This time, I was tasked with making a surprise "boo!" bag for a special teacher. The end result: A Boo! Box for Mrs. Nur! I hope she loves it. Elmer's is hoping to make another big impact this back to school season. Alongside their sponsorship of Bag It Forward, with bloggers gathering supplies for charity and encouraging their readers to join the movement, they are already donating one product for every “Like” on the Elmer’s Facebook page to the Kids In Need Foundation, and they will donate an additional item for each view of the video on the Kids In Need tab on their FB page. They are committed to donating up to 200,000 products to KINF, a non-profit organization dedicated to providing school supplies to those in need… imagine how many children will benefit from this partnership! And don't forget– Elmer's is a Upromise partner, so every time you purchase an Elmer's or Krazy Glue product with your registered drug or grocery card, a percentage of your purchase will be put into your Upromise account. In accordance to the FTC Guidelines and the WOMMA Code of Ethics, I am disclosing that this project has been compensated as part of a social shopper insights study for Elmer's #BagItForward #collectivebias, however all opinions are, as usual, strictly my own. You got a lot of great items! I'm sure she'll appreciate it! What a great program for teachers! As a photography blogger, I always check out everyone's pictures and I love the perspective you caught with the glue. Fantastic job! You got great items. 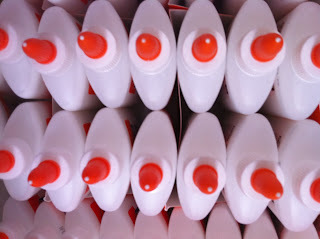 Love the photo from the tops of the glue bottles!